Home Edu Events IIT Bombay is the SINMQ Grand Finale’s CHAMPION! IIT Bombay is the SINMQ Grand Finale’s CHAMPION! 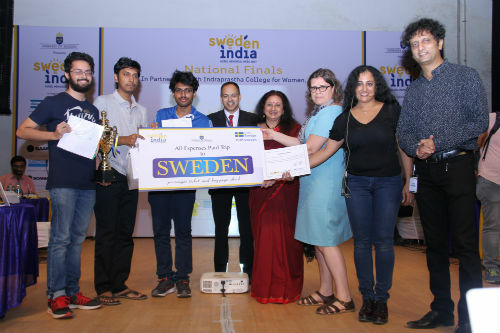 New Delhi: IIT Bombay, won the Grand finale of The Sweden India Nobel Memorial Quiz 2017 held at the I P College, Delhi University, today. The team of three comprising Jibitesh Behera, Kavin Aadithiyan C and Soham Dibyachintan did their college proud by answering the brain-teasers posed by Quizmaster Ms. Seema Chari and winning the Grand Finale in which winners from 11 cities participated. Mr. Gautam Bhattacharya, Chargè d’affaire and Ms Josa, Counsellor & Head of Economic Section from the Embassy of Sweden handed out the prizes at the Inter-Collegiate quiz competition which saw avid quizzers from across reputed colleges and technical institutes of the city and from nearby areas. The city rounds of Quiz were held in Hyderabad, Mumbai, Pune, Ahmedabad, Indore, Bhubaneswar, Kolkata, Guwahati, Hyderabad, Bangalore, Chennai and Delhi. The winners of the Grand Finale were awarded all-expenses paid trip to Sweden, where they will visit headquarters of the partnering companies, Swedish universities and the Nobel Museum. The Sweden India Nobel Memorial Week, which is celebrating its 11th edition, was instituted in memory of Swedish innovator, entrepreneur and philanthropist Alfred Nobel. It celebrates the contribution of Indian Nobel Laureates as well. The celebrations which are spread over a couple of months, will be showcasing the contributions, in terms of knowledge and innovation, of Swedish companies to the country and the Week has therefore been titled as “Sweden Makes in India”. The theme also includes sustainability and innovation.